Back in the end of 90’s did a discussion start on the Alphaville mailing list about a tribute release to the band. Around one year later in december 2000 was it time for a release party in Hamburg / Germany for the tribute album We Heard The Call. 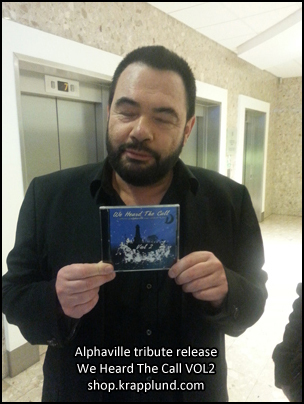 A great releaseparty with several bands played live during the evening and the highlight of the evening was that Mr Lloyd from Alphaville visited the party. The name for this release was taken from the song New Horizons lyrics released in september 1997 on the album Salvation. Around eleven years later, while the fans were waiting for the new Alphaville album I did start to think about to make a new tribute album to the band. After checking up the interest I start up this project with the permission from Marian Gold and Moonbase, a projekt that would be bigger than I thought it would be. From the idea that the album would consist of two CDs, it grew to become a 3-CD with contributions from fans and bands from alla around the world. 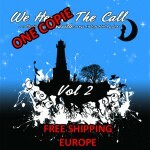 After 13 years of waiting was it now time for the release VOL2 of the tribute album We Heard The Call. A collaboration between fans from all over the world and the international fan community New Horizons / The Dreamroom (www.alphaville.org). This project show our and my love to the band Alphaville. A great feeling spread in the body when the packages arrived with the ready results from the factory and then when you opened the case and began to check through the artwork. What a feeling! Then this project entirely conducted by me personally, I have not had any financial help and have paid everything with my own money. I sometimes wonder what I gotten myself into but this whole project has also been very fun and exciting to implement. During this process, I learned a lot of things and things that could have been done differently, but as I always say – you learn throughout life. I hope there is interest to support this project by purchasing a copy of the release, and what the future has to show, no one knows, but who knows, maybe it will be a similar project in the future. Marian Gold and me posing in front of camera. Dear friends, congratulations for the realization of a new edition of “We Heard The Call”. You all make me proud and happy. Can’t wait to hear your songs. Dear friends, creators and organizers of WHTC, it is late I know but finally, during the busy days of this year’s ending, I had the time to listen through the entire “We Heard The Call” Compilation and I was really blown away by it. Not only was I flattered by the fact that our music inspires so many people but also the results are brilliant, lovely, aureate, the cat’s pyjamas!! 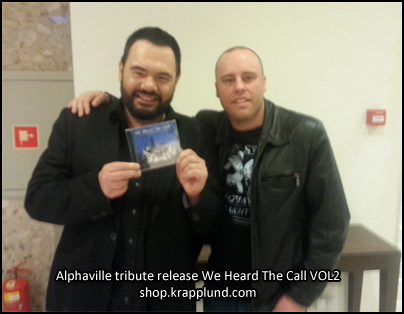 You know, I don’t like most of those “professional” Alphaville cover versions, but I do like each and every one of the tracks of “We Heard The Call”, as heterogeneous as they may be. Yes, indeed, they’re truly hetero-genius! Or in-geneous? Whatsoever, you made my day, you gave me some ideas. Marian Gold for supporting our project. Marian Gold, Bernhard Lloyd, Ricky Echolette, Frank Mertens, Martin Lister, Jakob Kiersch, David Goodes for their music!! Thanks to all who supported this project and bought a copy of the release!! THANKS!